Distribution: South-eastern New South Wales to north-east Queensland. Derivation of Name: Hibbertia...after George Hibbert, a patron of botany. scandens.... "climbing", a reference climbing habit of the species. 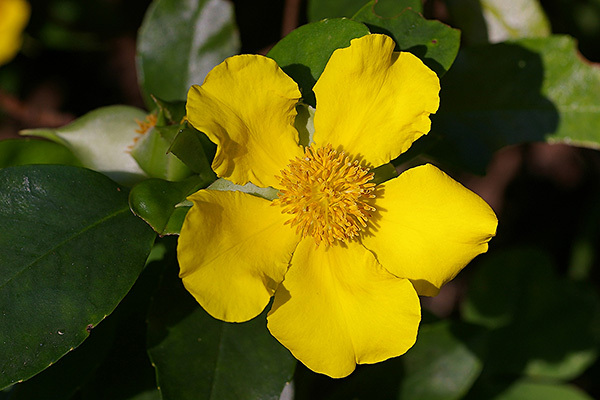 Hibbertia is a genus of around 150 species, most of which occur naturally in Australia. They are generally small to medium shrubs with yellow, buttercup-like flowers. Hibbertia scandens is a fairly vigorous climber or scrambler, growing to 2 to 5 metres long. It has elliptic to obovate leaves 3-9cm long by 1-3 cm wide. The large golden yellow flowers, 5-7cm across, occur throughout the year but are most commonly seen in late Spring and Summer. The individual flowers usually last only a day or two but new flowers are produced over a long period. This plant is very commonly seen in cultivation and will tolerate a wide range of climates, including exposure to salt-laden winds (this reflects where it is found in the wild; everywhere from sheltered mountain gullies to exposed sand dunes). It flowers best in full sun but will also grow successfully in semi-shaded areas. It prefers soils with reasonable drainage (like most other guinea flowers) and will tolerate at least moderate frost. The species makes an excellent screening plant on walls or fences, or growing as a scrambler among more established plants. However, it can easily smother smaller plants. Hibbertias, generally, are easy to grow from cuttings and H.scandens is no exception. Seeds can be slow and difficult to germinate.